Senior School prepares boys for Cambridge IGCSE and AS/A Levels. Each boy is expected to make academics a priority. We also acknowledge and support individuality within the broader needs of a vibrant and disciplined community, and we appreciate that boys possess different talents and interests and do our best to cater for this with an extensive sporting and co-curricular program that includes over 20 clubs and societies. Sport is compulsory. The College cares for its pupils in houses: currently fifteen of which 3 are for boarders and 12 for day boys. Each Head of House is supported by an assistant and general staff who are there to support boys and offer sound advice. This system actively underpins a positive and constructive school environment. Boys hold leadership positions as College and School prefects from which house leaders are chosen. 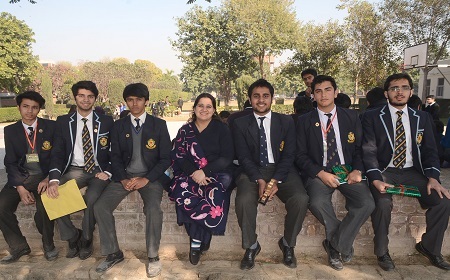 As in other sections of the College, we educate a diverse group of students from all parts of Pakistan, which satisfies one of the College's chief aims which is to educate the DNA of the nation, bringing boys together from differing social and linguistic backgrounds. At Senior School we offer schooling for the age range of 14 to 17+ years. The College has been a Cambridge Examination Centre since 1933 and is the only school in Pakistan with that distinction. Our teaching is aimed at preparing boys for external assessment across a wide range of Cambridge subjects, but also inspiring and challenging boys through Harkness Table sessions and Meta-Cognition tutorials run by our Adjunct faculty of distinguished old boys and visiting scholars. Part of this added curriculum includes regular visits from Balliol College graduates (Oxford University) and our Scholars in Residence Program. Boys in Year 10 and 11 (ostensibly O Levels) may opt either for the National or International curriculum -the latter not including requisite subjects for admission to universities in Pakistan. Years 12 and 13 study AS and A levels. Our Guidance counseling plays a crucial part in advising on subject selection. Many of our boys receive regular admissions to the world's top universities. Considerable attention is paid to the moral, intellectual, and character development of each boy. Qualities of enthusiasm and initiative, high standards of behaviour, decorum and discipline are regularly emphasized.